In order to work efficiently, you require tools that enable you to perform the task at hand with minimum stress and effort and save valuable time. This article delves into the various options you can avail of. Working for long period of time can cause strain on your body which can be harmful. These hefty little apps remind you to take breaks and relax between your busy work schedules. Lets have a look at some of these apps. soon as the specified time is reached, with a friendly tip. For instance, if you set the Schedule your timer to ‘00.05’, you will be prompted by a message after every 5 minutes. The tool displays the amount of time left on the taskbar. Prime Feature: The tool provides tips to improve your work life via quotes or custom messages. Workrave helps you configure break intervals. It is a small program which can be easily configured by selecting the ‘Preferences’ option from the taskbar. You can configure micro and rest breaks with an option to modify the language of user interface. The tool also provides a list of tips with pictures which you can access by selecting the ‘Exercises’ option. Prime Feature: Workrave enables you to establish connection with your network. EyeLeo reinforces the importance of your eyes as an as crucial a body part as your muscles. With the help of EyeLeo, you will be able to give your eyes frequent breaks. The tool will be useful for bloggers who spend several hours in front of the screen. Select the ‘Settings’ option by right clicking on the icon from the taskbar. The dialog provides options to configure short and long breaks with an ability to preview them. However, the tool lacks the feature for providing a custom message. Prime Feature: The long break option dims the display with a friendly message. 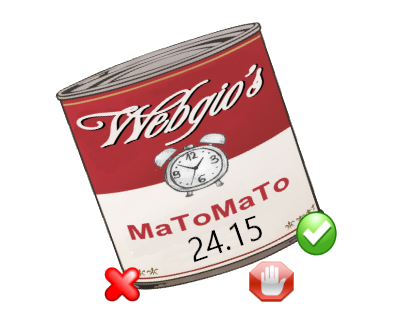 MaToMaTo is a timer based on the famous Pomodoro technique. The tool can be installed easily and requires .NET Framework 3.5 to run it. It is so hassle-free that you will not find any unnecessary options for this timer other than start and stop. The tool doesn’t produce any noises or sounds is therefore ideal for office environment. Prime Feature: It stays on the top of all programs and swings for the first 20 minutes, zooming in and out during the last 5 minute interval. Keep Focused enables you to manage time effectively using the Pomodoro technique. You just need to double click on the executable file to run the tool. Once you provide the details of the session, the tool will start to run in a session of 25 minutes. The tool can be dragged and placed anywhere on the screen. Prime Feature: You will be able to review your daily activities by selecting the ‘View Session Data File’ button. Tomighty is a simple desktop timer based on the Pomodoro technique. In order to run it, you need to select the icon and click on ‘Start’. The user interface can be modified using four themes. Prime Feature: Tomighty enables you to specify a custom timer interval. I recommend the Big Stretch Reminder which enables you to configure tips either to appear as a balloon or inside a message box from the Display panel which you can set by selecting the ‘Settings’ option from the taskbar. EyeLeo is simply a tool which reminds you to ‘take a chill pill’. It is not possible to provide any custom messages on it.